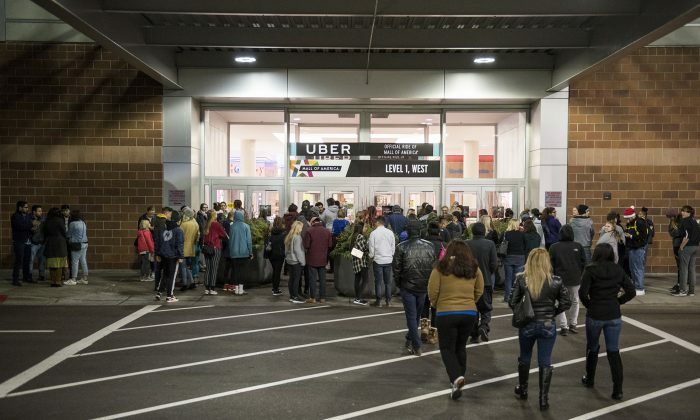 A fight during Black Friday sales at a shopping center caused Alabama’s largest mall to close 40 minutes early on Thanksgiving night. Police and firefighters responded to a report of two young women engaged in a fight at Riverchase Galleria with a group of bystanders watching after 11 p.m., according to a statement on Nov. 24. The pair was separated and treated by paramedics for minor injuries. According to the police, the fight was not related to Black Friday sales and no arrests were made in this incident. Earlier in the night, police received another report of shots being fired outside the same mall. Lt. Keith Czeskleba said they did receive calls reporting gunfire, but responding officers believe it was someone shooting off fireworks, reported AL.com. Videos of the fight have been posted on social media, showing police responding to the incident. Hoover police said they will have extra officers patrolling during the holiday season to ensure the safety of customers at shopping centers. Other locations also faced similar incidents during the Black Friday sales. A video was posted on social media showing four grown men fighting over a toy during sales at Walmart. The Galleria reopened to shoppers at 6 a.m. Black Friday morning and will close at 10 p.m.